5995 W. Irlo Bronson Hwy. 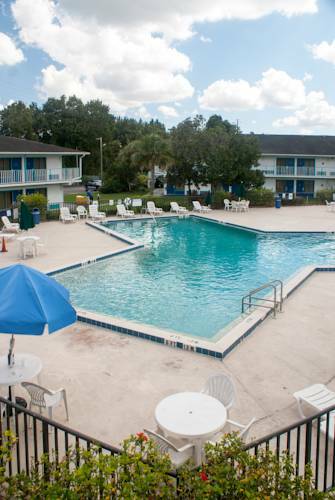 The Rodeway Inn Maingate hotel in Kissimmee, FL gives you an affordable place to stay that you can count on. Our pet-friendly hotel is near Orlando, Disney World, ESPN Wide World of Sports Complex, Universal Studios Florida and SeaWorld Orlando. Enjoy our amenities that include free coffee, an outdoor heated pool and guest laundry plus a newsstand, gift shop, car rental and copy and fax services. Each fresh, clean room features a coffee maker, safe and TV. We also offer poolside rooms with a microwave, refrigerator and kitchenette. Also, earn rewards including free nights and gift cards with our Choice Privileges Rewards program.No Pets Allowed. Must be 1 adult 21 years or older in each room. Daily Safe Fee of $1.69 per night will be payable upon arrival. - Orlando Sanford Int'l. Arpt. Erected in late 2010. Stands 22 feet high, weighs two tons. Officially titled "For Those Who Serve."